Distributing your software is the main reason you uploaded it to Bintray in the first place. Then why would you want to restrict downloads? There are different reasons why you may want to prevent Bintray users (whether they have an account or are anonymous) from specific countries from downloading your software. For example, government security or export regulations may forbid you from doing business with certain countries, or your own company may even restrict your particular organization to distributing your software in your own local region of the world. Geo Restriction addresses these use cases and lets you define a blacklist of countries per repository from which download is forbidden, or a whitelist which specifies the only countries from which download is allowed. Placing country-wide restrictions through Geo Restriction may not always give you control that is granular enough. For example, you may welcome downloads from your main target market, however, there may also be a bot that is generating multiple fictitious downloads in the same market and corrupting your download statistics. 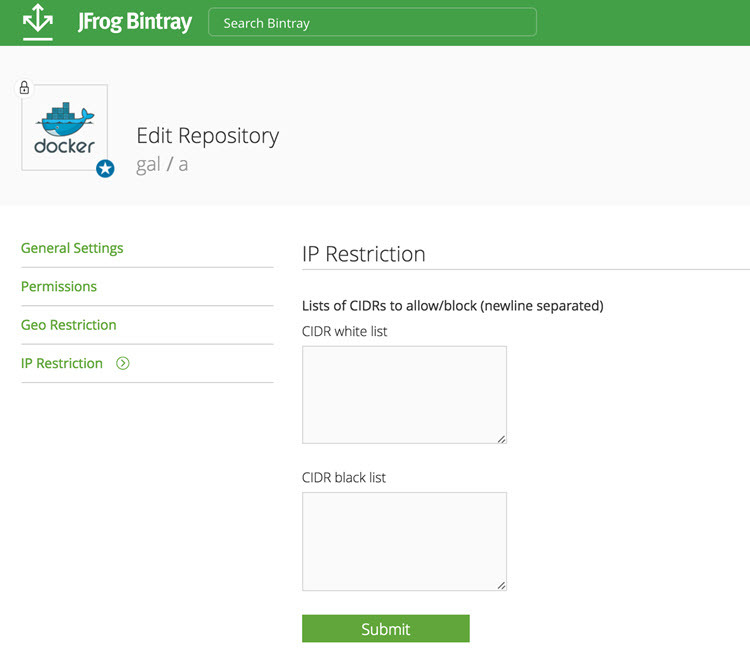 Bintray’s solution to this type of scenario is through a whitelist and blacklist of CIDRs which give you granular control over the IP addresses which are authorized to download your software down to a specific IP address.